Popular stories from the bestselling "The Beginners Bible" are now adapted to the proven I Can Read! format for introducing younger children to the joy of reading. Full color. - Publisher Now in this English/Spanish bilingual edition! In the beginning, the world is perfect. Everyone is happy. But then a bad thing happens. Will it stay this way forever? About "Yo Se Leer! 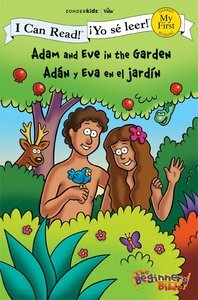 Adan Y Eva En El Jardin (Adam and Eve in the Garden) (My First I Can Read/beginners Bible Series)"
Mission City Press is a Christian publishing company dedicated to teaching kids to live a life of faith with passionate devotion to Jesus Christ. Miriam's mom puts her baby brother Moses in a basket on the river because she cannot keep him. Worried Miriam stands by the river to watch. Will he be okay? Will anyone find him?